There appears to be a large literature using the same words to say that "nanotechnology" is an "enabling" technology that will "revolutionize the food system". Nanotechnology, as a new enabling technology, has the potential to revolutionize agriculture and food systems in the United States and the World. Nanotechnology is an enabling technology that has the potential to revolutionize agriculture and food systems. As an enabling technology, nanotechnology has vast potential to revolutionize agriculture and food systems. Nanotechnology is an enable technology that has the potential to revolutionize agriculture and food systems. And that was presumably the source for the first sentence of the abstract for a new 2015 article in Critical Reviews in Food Science and Nutrition, by Harleen Kour, Anisa Malik, Naseer Ahmad, Towseef Wani, Raj Kaul, and Anju Bhat. Before we judge too harshly, I should acknowledge that I make little effort to develop novel language for routine background information. It would not shock me if a sentence akin to the following appeared in more than one publication: "The Supplemental Nutrition Assistance Program (SNAP) is the nation's leading anti-hunger program and an important part of the social safety net." But that is a different issue from reusing language for the main point of an article. In fact, nanotechnology introduces new chances for innovation in the food industry at immense speed, but uncertainty and health concerns are also emerging. For the 2015 Kour et al. article in particular, the indebtedness has risen sufficiently high that the good journal Critical Reviews in Food Science and Nutrition should probably look into the similarities. More generally, does there seem to be too large a literature parroting the same not-too-skeptical claims about nanotechnology? Presidential candidate Ben Carson was asked during debate this week about his ties to Mannatech, maker of a dubious nutrition supplement based on "glycoscience." I didn’t have an involvement with them. That is total propaganda, and this is what happens in our society. Total propaganda. I did a couple of speeches for them, I do speeches for other people. Jim Geraghty, who thoroughly covered these ties already last January in the National Review, yesterday pointed out that Carson's response appears to be untrue, or in Geraghty's words, "bald-faced lies." Geraghty explains how the paid speeches were compensated highly enough that reasonable people will recognize this as a paid sponsorship arrangement. The wonderful thing about a company like Mannatech is that they recognize that when God made us, he gave us the right fuel, and that fuel was the right kind of healthy food. Geraghty describes the company's "long, checkered past" in the National Review. A 2014 post in this blog noted that food safety problems are fundamentally about lack of public information. If consumers had magic sunglasses that displayed the presence of Salmonella on chicken in the grocery store, there would be no need for government regulation. Immediately, faced with market consequences for distributing chicken with Salmonella, the companies would clean up their product. The Washington Post's Wonkblog this week reports on Yelp's San Francisco restaurant review site, which is conducting an experiment with the online equivalent of these magic sunglasses. Yelp, the popular Web site that lets consumers review everything from bistros to body shops to yoga studios, quietly began running an experiment in San Francisco over the past week. The pages for a small fraction of the city's restaurants on the site now bear a new consumer alert. The warnings are shown for the review pages of restaurants that received very low scores from health inspectors. One feels bad for the restaurants, but this idea is intriguing. The National Restaurant Association mentioned concerns. 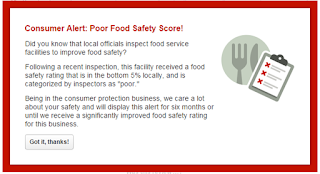 Yet, if the inspections use standards that all restaurants really can satisfy, this ought to help consumers get access to safer and cleaner restaurants without doing the restaurants much lasting harm. Rebecca Lampman lives and works with her husband and three children on their 250 cow dairy farm in Bruneau, Idaho. In addition to the cows, the family has an assortment of other farm animals that they enjoy. Rebecca also writes regularly for The Progressive Dairyman. Her published articles and a link to the farm's Facebook page can be found at the Feminist Farmer. Our dairy is forced to participate in the porking of the populous. I regularly find articles in the local farm paper with titles such as, “Dairymen’s Check Off Dollars Do Double Duty”. These articles are fed to farmers to explain how partnerships between fast food and the dairy checkoff program have fattened our wallet, causing some to smile. As a dairywoman and mother, however, I frown, knowing that our farm participates in America’s obesity crisis. I love dairy products and believe they can be part of a healthy diet. What I don’t love is being forced to pay an assessment that is used to encourage Americans to over-consume dairy products that are a major ingredient in many processed foods. Despite having farmed for 20 years, it wasn’t until attending an industry meeting that I began to understand how this mandatory dairy checkoff program started. 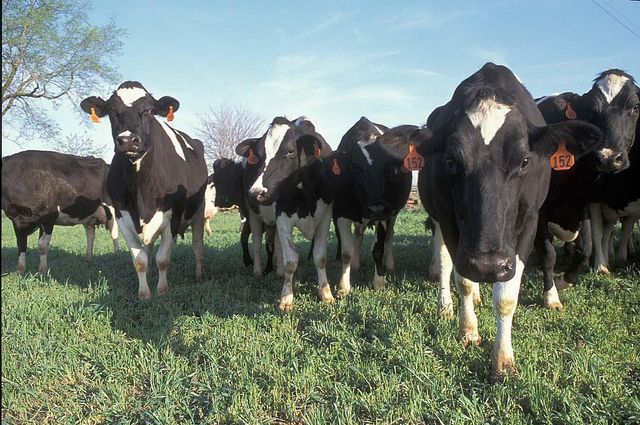 In the early 1980s, America was swimming in milk, so Congress passed the Dairy Product Stabilization Act -- a federal program to encourage consumption of dairy in an effort to deal with over production -- paid for by the farmer in the form of a mandatory assessment or tax. I learned the “Got Milk” ads that the checkoff program used to sponsor are yesterday’s news. The dairy industry now invests our checkoff dollars in partnerships with food companies like Domino’s, McDonald’s, Taco Bell, and Pizza Hut -- all restaurants I avoid out of concern for my family’s health. I realized that good news for the industry was bad news for our nation’s waistline. I have since been more acutely aware of the many ways in which my product is used and marketed with my money. A bizarre partnership with Coca Cola has been announced. McDonald’s is switching from margarine to butter. And what about those articles telling us how grateful we should be for the checkoff program? Why is our support courted so heavily? Is someone concerned that farmers will begin to see that we are part of an industrial food and marketing system that is contributing to the obesity crisis in America, a crisis that touches so many of our families in personal ways in the form of diseases like diabetes, cancer, and heart disease? Industry leaders may dismiss my concerns with the argument that people have the freedom to make any food choices they want, and that the dairy industry and its partners are simply supplying the public with the kind of food that they demand. If it is all about personal choice and marketing has no influence on what is consumed, then why must I pay 15 cents for every 100 pounds of milk our cows give for dairy product promotion? If personal choice is what is so vital to protect and preserve, then I would like the freedom as a dairy farm to choose not to participate in a dairy checkoff program that contributes to obesity. Our dairy farm is our life. My family believes that I am worrying about something that I cannot change. My husband and I have spent twenty years working with our children to build our farm. We enjoy dairy products and hope to continue to provide them for those that would like to enjoy dairy in healthy forms and amounts. The sign on our barn says, “All that we have we owe to udders.” It is true. Our farm is about animals and people. I owe it to others to share the misgivings I have about the system of which I am a part. Our food system doesn’t have to remain stagnant or entrenched in its practices. We can make this better. Angus Deaton earlier this month won the Nobel Prize in Economics (or, more formally, the Sveriges Riksbank Prize in Economic Sciences in Memory of Alfred Nobel). In the entire field, Deaton is one of the top three or four economists I admire most and read most closely. It has been fun to watch the news reports struggle to pin down exactly what Deaton's topic area is. He has made major contributions to the theory and methodology of analyzing consumer demand, development economics, analysis of government policies, the analysis of decision making under risk and uncertainty, and survey measurement. Many years ago, I faced a similar struggle in reviewing Deaton's book The Analysis of Household Surveys: A Microeconometric Approach to Development Policy for the American Journal of Agricultural Economics. I felt Deaton had made the book more difficult to read by using real-world examples rather than simplified hypothetical examples. It would have been easier on student readers if he had cleaned up the extraneous details. Yet, the real-world experience is ultimately more rewarding and deserving of study. Here is the first paragraph of that review. Like a safari, this text is a rugged tour through a broad swath of author Angus Deaton’s intellectual countryside. It succeeds admirably as a teaching tool about contemporary research methods using household surveys. Moreover, the author has a distinctive vision of economically sound and fundamentally empirical research, yoked to the service of important policy questions. The entire book will interest agricultural economists with a focus on developing countries, but many topics will interest any economist who studies household surveys. The book is sometimes eccentrically organized, prone to digression on any topic in applied economics, and— by the author’s own admission—it is incomplete as a manual on the analysis of household surveys. It relies on detailed real-world examples, which require lengthy explanations that might initially seem unrelated to the author’s main points. However, while more artificial examples might have helped some of this book’s teaching purposes, they would have done a disservice to its implicit vision of honest empirical research. I would rather encounter this material on Deaton’s safari than at the zoo, where the ride is smoother and the animals are easier to see, but where the habitat is make-believe. For several years now, some academic friends and I have been reflecting on frequent flying in university communities during a time of climate change. This is not about any particular colleague's personal flying behavior, but instead about collective action to improve the climate profile of our academic communities. We finally have gotten organized for action and are releasing a new petition campaign to encourage universities and professional associations to greatly reduce flying. We realize that we cannot ask academics to change their own behavior in isolation, because so much depends on the professional world we live in, including expectations to attend meetings and conferences. So, we deliberately address the petition to universities and professional associations at the same time. Please support this petition through this link at change.org and see our petition project web page at www.flyingless.org. In addition, supporters who are academics should email us at academicflyingpetition@gmail.com to have their name added to our public List of Academic Signatories. We have a great list of more than 50 initial supporters, from diverse disciplines, in countries all around the world. Please share this widely in person, by email, and through your social networks. Follow the Twitter handle @flyingless and hashtag #flyingless or add your name to the change.org petition for news and updates. 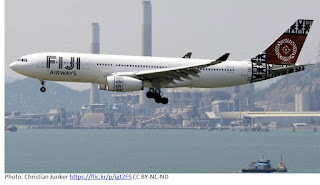 What is the global and U.S. environmental impact of flying? Is it sometimes important for academics to fly? Is my decision to fly irrelevant, because the plane would have flown anyway? Is it okay to fly if I purchase carbon offsets? Is reduced flying an individual-focused agenda that undermines more important policy change? 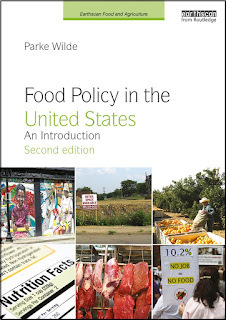 You may wonder why I tackle this topic in a blog about U.S. Food Policy. Questions of environmental sustainability arise all the time in food policy. A key dynamic in U.S. food policy is the deep suspicion and skepticism that many Americans working in agriculture and the food industry have toward university-based scientific experts who discuss environmental issues. In part, academics can address these issues just by stating the science clearly. Yet, we may enhance our moral authority to speak hard scientific truths about sustainable food production if we also apply the same fearless scrutiny to our own industry of higher education. That, in turn, requires us to speak frankly about flying. The petition is modest and reasonable, not shrill. Please feel free to comment here. A report (.pdf) this week from the University of Tennessee Institute of Agriculture argues that over-reliance on corn-based ethanol in the Renewable Fuels Standard (RFS) has caused environmental problems. 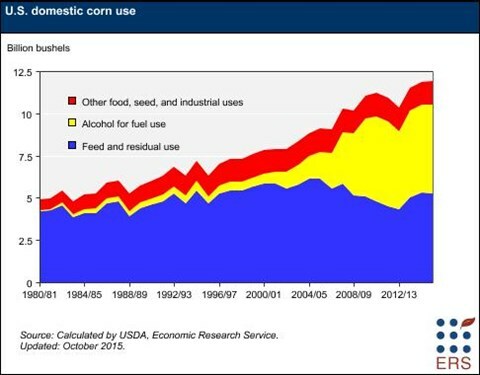 Corn-based ethanol increases global food prices by diverting an important food source to fuel. USDA data show that ethanol for fuel now uses more than 40% of all U.S. corn production. The RFS is the topic of a new video advertisement by opponents who encourage faster progress toward more advanced biofuels technologies. Agriculture Secretary Tom Vilsack and Health and Human Services Secretary Sylvia Mathews Burwell issued a joint statement this afternoon, which appears to say that sustainability issues will not be considered in the 2015 Dietary Guidelines for Americans (DGA). In terms of the 2015 Dietary Guidelines for Americans (DGAs), we will remain within the scope of our mandate in the 1990 National Nutrition Monitoring and Related Research Act (NNMRRA), which is to provide “nutritional and dietary information and guidelines”… “based on the preponderance of the scientific and medical knowledge.” The final 2015 Guidelines are still being drafted, but because this is a matter of scope, we do not believe that the 2015 DGAs are the appropriate vehicle for this important policy conversation about sustainability. The announcement follows months of public debate after the Dietary Guidelines Advisory Committee this year included some discussion of environmental sustainability in its report, which provides the scientific basis for the guidelines that will be released later this year by USDA and DHHS. As noted on Thursday, several colleagues and I recently had published a commentary in the journal Science, arguing that sustainability issues are just as much relevant to dietary guidance as physical activity or food security, both of which are widely accepted as in scope. Even in today's announcement, the citation from the 1990 legislative authority broadly defines the scope as "nutritional and dietary information" (not merely nutritional information alone) based on "the proponderance of scientific and medical knowledge" (not merely medical knowledge alone). The decision makes sense primarily as a response to intense political pressure. As a result of today's decision, USDA and DHHS will enjoy some shelter from criticism in Congress this month. The scientific community and the public will continue to discuss food choices and the environment together in the same breath. It is unavoidable to do so. The main impact of today's announcement is to make the 2015 DGA less relevant, uselessly silent on some of the most important food guidance questions of our time. The public will turn elsewhere for authoritative information on sustainability and diet. In a commentary today for the journal Science, several colleagues and I explain why we think it is fine to include considerations of environmental sustainability within the scope of the U.S. Dietary Guidelines for Americans (DGA). The challenge is how to produce the most healthful foods in a way that sustains employment in the agricultural sector and minimizes adverse impacts on the environment. All major constituencies concerned with food security and health must wrestle with sustainability and dietary choices together. It is right and proper for the DGA process to lead the way. The commentary, which may be gated (sigh), grew out of a fall 2014 workshop initiated by the first author, Kathleen Merrigan, who was until 2013 the Deputy Secretary of Agriculture, and who now leads the sustainability program at George Washington University. Other authors include Tim Griffin, myself, Kim Robien, Jeanne Goldberg, and William Dietz. This issue also had been the focus of an earlier workshop, to which I contributed, for the Food Forum of the Institute of Medicine in 2013. In an era of global climate change, the issue of sustainability is so important to the food system as a whole that policy-makers and the general public will inevitably find themselves considering environmental issues as part of almost any discussion of food choices. See for example the recent article in Nature by David Tilman and Michael Clark. There is no way for the U.S. government to avoid having people talk about sustainability and dietary guidance jointly. That matter is already settled. The only question on the table is whether we will all need to struggle to compile multiple authoritative sources on these issues or instead whether -- as seems more sensible -- both issues will be addressed together in the same coherent federal guidance document. Other countries include sustainability issues in their dietary guidance. For example, dietary guidelines in Brazil and the Netherlands take a comprehensive approach. The U.S. Dietary Guidelines Advisory Committee (DGAC), whose report provides the scientific basis for the upcoming release of the 2015 Dietary Guidelines for Americans, already discusses sustainability in a sober and moderate way. It seems wise for the actual Dietary Guidelines to do likewise. Unfortunately, some in Congress have taken steps to instruct federal agencies to limit the scope of the guidelines to "diet and nutrient intake" only. It would be absurd to limit guidelines to just those two topics. Along with preventing discussion of sustainability, the proposed language from Congress would prevent the guidelines from discussing physical activity. Yet, we all recognize that food and physical activity should be discussed together. It is already within the mandate of the Dietary Guidelines to consider food security -- access by all people at all times to enough food. Far from being a loose cannon, the Dietary Guidelines Advisory Committee recognized environmental sustainability as sufficiently important to food security to deserve at least a brief and restrained mention. It would be silly to reverse that persuasive and sensible approach.